Cats are complicated creatures. There are a lot of facts we don’t known about these animals. On the other side, we know that they are great pets and they are smart. In addition, we know that their character is tough and almost impossible to change it. The most important fact about cats is the food. We all know that they are carnivores, so they like eating meat. 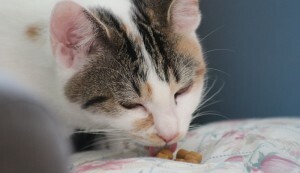 However, most cat owners have an impression that feeding cats with fruits is possible as well. One of those fruits has to be a banana. Should you give a banana to your cat? The first and the most important thing you will have to know is those cats can eat bananas. They are not toxic to your pets nor do they have any side effects. In addition, horses and dogs can be fed with bananas as well. According to the ASPCA, bananas are a good source of nutrients for your cat. On the other side, you cannot feed your cat only with bananas. Although, they have an impressive health benefits to us, humans, they don’t have any of those advantages on cats. Simply said, you will have to feed your cat with foods that she must eat (meat or cat food) and you may give her bananas sometimes. Keep in mind that bananas contain a lot of sugar, so they may cause some issues to your cat, if you feed her too much with bananas. 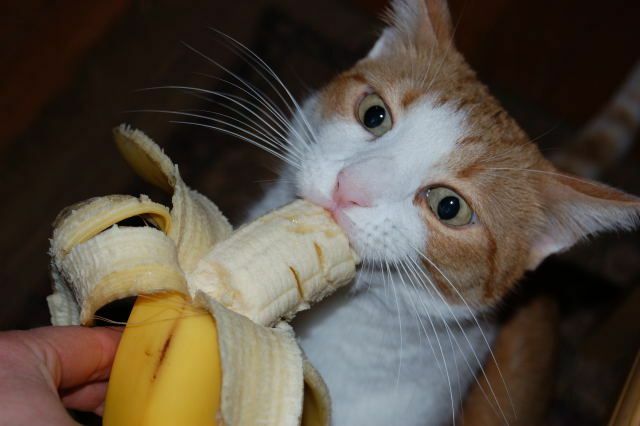 Even worse, cats may develop diabetes or get fat, if they eat bananas every day. That’s why it is mandatory not to give too much of this fruit to your pet. As aforementioned, cats can eat bananas. They don’t have some severe side effects, unless you give too much of it to a cat. On the other side, when you feed your pet every day, with a banana, there are some issues that will probably occur. For example, most cat owners claim that cats develop constipation, if she eat the whole banana. In some cases, tummy issues are possible as well. Bananas are useful to people due to the fact they give energy and vitamins. These benefits won’t be experienced by your cat. Cat’s digestive system cannot properly and efficiently digest fiber and sugar as a human’s digestive system.The bottom line, you can feed your cat with bananas, just make sure you give her small (2-3) pieces per day. Even if your cat looks at you, while you are eating a banana, don’t risk and give her a big piece. It is better to give her a small amount of cat’s food or something that she likes. In some cases (rarely) a cat may experience the immune reaction, if she eats a banana. This happens if a cat has antibodies that will bond with the chemicals found in the banana, so they will start an inflammatory. Sadly, there is no way to determine is this going to happen to your cat. The best thing to do is to feed your cat with small pieces of a banana and if notice some side effects, you must stop as soon as possible. In essence, the symptoms will be similar when people who shouldn’t eat cheese break the rule. If the problem continues, you will have to take your pet to a veterinarian. The solution is simple and it won’t hurt your cat. Does your cat like bananas? It is a well-known fact that when you eat something, your cat will look at you and give you ‘’the look’’ you cannot resist to. Another well-known fact is that they will do this no matter what you are eating. 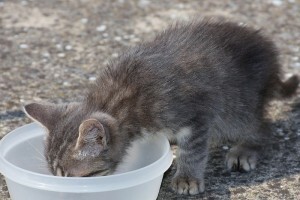 Keep in mind that you shouldn’t fall to the heir influence and give the food you are eating to your cat in big amounts. This applies to bananas as well. Another fact is related to, does your cat like eating bananas. Some cats do, but some cats don’t like it, so there is no point to make a pressure ant try to convince your pet to eat this fruit. The main thing is that your cat won’t get any benefits of eating a banana, so there is no point to give it if she doesn’t like it. Cats that were fed with bananas when they were little, usually like eating them when they are grown up. Bananas should be given to cats as a small treat. They don’t have any benefits and large amounts may have a negative effect to your cat. On the other side, it is a great feeling to share a piece of banana with your pet. At least you will avoid that sad look in her eyes and your cat will be happy. In addition, if she don’t like a banana, don’t give her the next time, due to the fact she won’t change her mind.